I’ve never played rugby. I once went to see a Six Nations game in the rain — and drank a mug of Bovril, which sounds weird, but when in Rome (or Scotland) — but I can’t say that I understand the game. I also don’t understand what rugby has to do with software development, but they both have scrums. I recently spent a week in a scrum developing a roadmap for MyLawBC. For the last few months we’ve been working with HiiL, a non-profit in the Netherlands, to develop a new website called MyLawBC. The heart of the site is guided pathways. The basic idea behind guided pathways is that when you come to the site, it will ask you some questions about your problem. Based on your answers, it will diagnose your legal problem and give you an action plan unique to your situation, which will help you take the steps you need to resolve it. Hiil and the Dutch Legal Aid board created a similar site called Rechtwijzer, so we’ve been working with them to learn from their experiences. 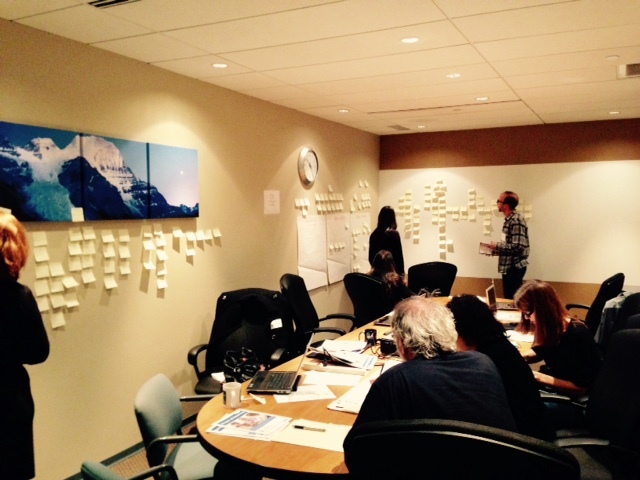 Two weeks ago, we held a weeklong scrum in our Vancouver office to map out how these guided pathways will work. When you Google “scrum software development” you’ll probably run across a definition that uses the words agile framework, complex projects, and innovative scope. It’s very different from how we normally think and work, and it’s a lot of work, but it gets results. Two folks from HiiL, Jin Ho and Tsvetelina, came to Vancouver to help us conduct the scrums. We had nearly 30 people from all different walks of life helping us develop the tool: lawyers, community workers, other legal organizations, government officials, intermediaries, members of the public, and LSS staff. We worked on pathways for family law and family violence; wills, estates, and life planning; and foreclosure. We started with the end points, figuring out where we wanted the user to be at the end of the process. For example, if we take divorce, then one of the possible end points could be the person being divorced, happy, and in stable living conditions with a plan for communicating with her ex. From there, it’s a matter of working backwards and figuring out how the user gets to that point and what information, instructions, and resources they need along the way. Sounds easy right? I spent most of my time working on the foreclosure pathway, which is based on our booklet Can’t Pay Your Mortgage. I thought that it would be easy enough. I mean, there’s really only two outcomes (you keep your house or you lose it), and the court process itself is pretty linear. I was wrong. There are a lot of ways you can get to or be involved in that court process. It was the easiest of all the topics we covered, but that doesn’t mean that it was easy. The end of that week was unusual. Most of us had spent over 40 hours working only on this and were noticeably tired, but everyone was still excited to keep working on the project. I don’t know if you can be simultaneously burnt-out and keen to keep working, but somehow we were. The pathways were mapped out, but we still wanted something tangible, or at least as tangible as a website can be. That comes later. Early next year is when the first prototype should be ready and when the fun will really start. This post originally ran July 31, 2014 on the ELAN blog. Earlier this month, we launched an entirely new kind of animal: a fill-in-the-blanks/choose your own options 7-part separation agreement guide. The feedback that LSS received through community consultation over the years has revealed a need for material to help people draft their own separation agreements.